Unique Recipes to Celebrate National Coffee Month | Minas Espresso Inc. This of course is a legend, but regardless of its origin we still enjoy the benefits and tastes of this legendary brew. 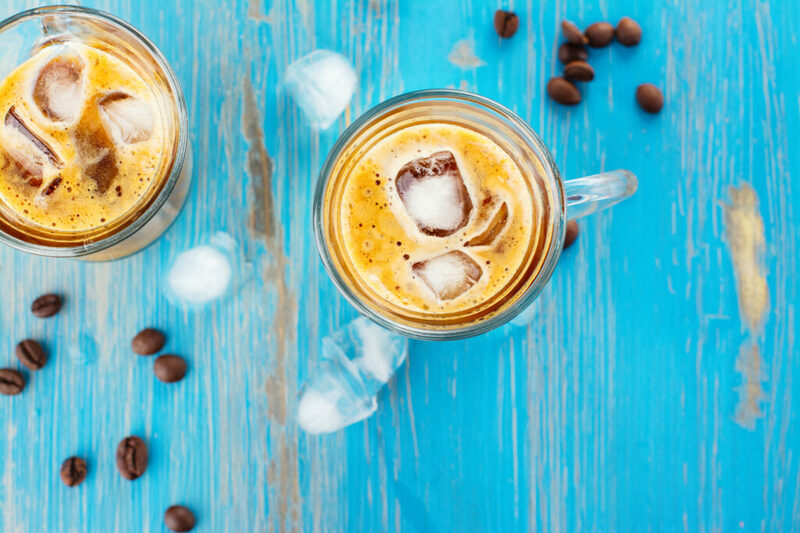 With August being National Coffee Month, look below for some tasty coffee recipes to indulge in all month long! These include our usual drinking kind, some food, and some body care. Blend all ingredients together. Soak your feet for 10 minutes in warm soapy water. In a circular motion, apply 1 teaspoon of the scrub to exfoliate away dead skin. Rinse your feet off in warm water and then pat dry. You can also use this body scrub in the shower. Leftover scrub can be stored in an air-tight container at room temperature. Using a food scale, weight the beeswax and cocoa butter, then heat until half melted. Weigh the shea butter and add to the mixture. Continue cooking until completely melted. Add a pinch of sugar if you wish and stir well. Weigh the coffee-infused olive oil and add to the mixture, then blend to combine thoroughly. Add the 10 drops of clove essential oil and each of the ½ ml of flavor oils and mix well. Once mixed thoroughly you can slowly pour into the containers and let cool. Once cooled and solidified you can add your lid. Enjoy your homemade lip balm! Preheat oven to 350F. Line baking sheet with parchment paper. Mix all ingredients together until the almonds become evenly coated and sticky. Spread mixture onto the baking sheet evenly. Bake for 5 minutes, toss almonds, and then bake for another 5 minutes (if you can resist). Let cool completely before eating. If the coffee grounds are not dried out, spread onto a baking sheet and bake for 6-10 minutes at 350 degrees Fahrenheit. Remove and let cool. In a spice grinder, grind coffee grounds and peppercorns until texture is coarse. Pat steaks dry with a paper towel and sprinkle with salt and the rub, coating well. Press the rub into the steaks. Heat a pan or skillet over medium-high heat until hot and add the oil. Add the steaks and cook to desired preference. Place in a blender and blend until smooth. Poor into desired glass and enjoy. Combine coffee, cardamom, orange zest, and water in a jar with a lid. Let sit for 24 hours, then strain through a cheesecloth or a coffee filter. Serve over ice. If too strong, you can water it down. Put the walnuts and oats in a blender and pulse until ground into a powder. Add the remaining ingredients (except ice) and blend until smooth, then add the ice and resume blending until smooth. Enjoy. Whisk together the espresso, cocoa powder, and pinch of cayenne pepper. Steam or heat the milk then whisk in the espresso mix, spooning a bit of the foam on top. Pour into desired mug or cup and sprinkle with cocoa powder and cayenne. Pour root beer into an ice cube tray and freeze until solid. Combine root beer cubes, milk, chocolate and caramel syrups, instant coffee, vanilla extract, and sweetener into a blender. Blend until smooth and enjoy. Blend ingredients until smooth in a blender. Boil the water, sugar, cinnamon, and clove in a large saucepan over high heat. Stir until sugar is dissolved, then remove from heat, stir in the coffee grounds, cover and steep for 5 minutes. Stir in the vanilla and chocolate syrup, then strain through several layers of cheesecloth to remove the coffee grounds and spices. Serve in your favorite mug or cup with whipped cream on top. Have a happy National Coffee Month!